"Every book should begin with attractive endpapers . . . . Preferably in a dark color: dark red or dark blue, depending on the binding. When you open the book it's like going to the theater. First you see the curtain. Then it's pulled aside and the show begins." Eleven years ago, when my daughter was a baby and was first introduced to a family friend, he said that her mouth was like that of the actor Brendan Fraser. I had never noticed his mouth before, but after hearing that remark my eyes were drawn to this actor's mouth forever after, and still are. When I watched the movie Inkheart last night I was once again drawn to this actor's mouth, not just for the shape of his lips, but also because of his ability to read aloud and bring characters from a story to life. Not in the usual sense, but in a magical sense. Fictional characters climb out of the pages of books and into our world. Brendan Fraser plays Mo, a bookbinder who also happens to be a "Silvertongue", which means he has the ability to draw characters out of the books they inhabit and into our world. The problem is that real-world people can get sucked into those same books at the same time, and vanish, which is what happened to Mo's wife, Resa, while he was reading to her--and released into the world of the book's villain, Capricorn. 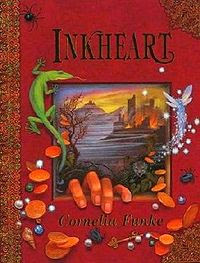 Inkheart the movie is based on the best-selling book for children (and those young at heart) of the same name by Cornelia Funke. 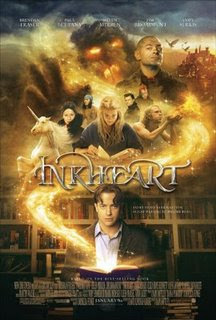 Inkheart (2003) is the first book of the Inkworld trilogy, which also includes Inkspell (2005) and Inkdeath (2008). The movie differs from the book, and misses some of the subtlety, grace, and mystery of the book. But I did enjoy seeing the characters who come to life in the book come to life on the silver screen, and appreciated the many messages which are "book-affirming", about the beauty and magical nature of books, stories, and imagination. I know--it's unusual to compare a girl baby's mouth with that of a grown man's--and for that reason I remember the remark.